This is a fun experiment that’s almost like a magic trick. I came upon this when we were having fun with the materials for the Sky Blue Experiment and Cutie Pie was trying to make his own little experiment. It goes without saying that this is a science experiment, so use protective clothing, cover your workspace if you deem it necessary and make sure there is an adult around! Pour exactly 1 tbsp water into container. Mark the level of the liquid with a line or the number 1. 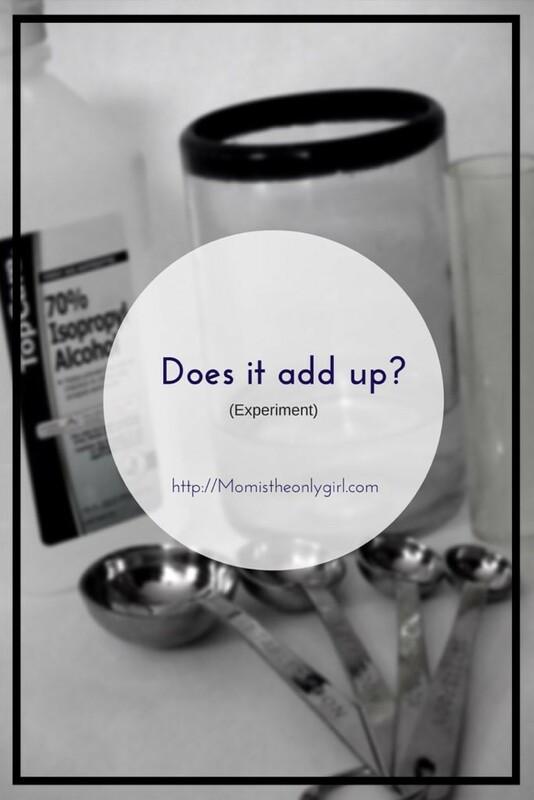 Hypothesize what will happen when you add a tbsp of water and a tbsp of rubbing alcohol together. If you are not letting your child know there are two different liquids, make sure to use the correct phrasing! Add food coloring to 1 tbsp water and put into container. It should be level with your first line. Add food coloring to 1 tbsp rubbing alcohol and add it to the water. Questions: Is this level with line 2? Was your hypothesis correct? Explanation: You just discovered spaces lurk between water molecules!